Deltoid Front outer1/3rd of the clavicle, border of the acromion, and lower edge of the spine of the scapula Deltoid tubercle on the middle outer surface of the humerus. True abduction-entire muscle. Flexion and inward rotation-anterior fibres.Extention and outward rotation-posterior fibres. Over the head of the humerus from the anterior to the posterior side. Pectoralis Major Inner ½ of the anterior surface of the costal cartilages of the (1-6) ribs, and adjoining portion of the sternum. Flat tendon 2 or 3 inches wide to the outer lip of the groove of the humerus. Flexion-drawsthe arm forward and upward from the side. Extention-extends the humerous, particularly when it has been moved above the shoulder level. Rotation-inward-routs the humerus inward as it flexes Broad area of the chest region between the clavicle and the 6th rib. Lattissimus Dorsi Posterior crest of the pelvic back of the sacrum and spinous processes of the lumbar and lower 6 thoracic vertebrae, and slips from the lower 3 ribs. Medial lip of the bicipital groove of the humerus. ExtntionRotation inwardAdduction-draws the arm to the side from the side horizontal position and rotates inward as it adducts. Lateral, oosterior aspect of the trunk below the armpit. The deltoid muscle is used commonly in any lifting movement. The trapezius muscle fixes the scapula as the deltoid pulls on the humerus. This muscle is used in all lifting movements if the arms are at the side in lifting. Any movement of the humerus on the scapula will involve part or all of the deltoid muscle. Lifting the humerus from the side to the position f abduction at the side horizontally, is a typical action of the deltoid. Placing a dumb bell in the hand and raising the arm directly to the side is an excellent exercise for this muscle. It also works as a helper to the latissimus muscle when extending and adducting the humerus from a raised position. The pectoralis major and the anterior deltoid work closely together. The pectoralis major is used powerfully in press-ups, pull ups, and throwing. The Latissimus dorsi muscle has strong action in downward rotation and adduction of the humerus. It is one of the most important extensor muscles of the humerus and contracts powwrfully in chinning. 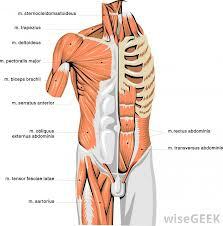 Exercises in which the arms are pulled down bring the latissimus dorsi muscle into powerful contraction. Chinning, rope climbing are excellent exercises to strengthen this muscle. In barbell exercises the basic rowing and pullover exercises are good for developing the ‘lats’.